This article is about the discovery of land under public international law. For pre-trial phase of a lawsuit, see Discovery (law). The 1823 case was the result of collusive lawsuits where land speculators worked together to make claims to achieve a desired result. John Marshall explained the Court's reasoning. The decision has been the subject of a number of law review articles and has come under increased scrutiny by modern legal theorists. The plaintiff Johnson had inherited land, originally purchased from the Piankeshaw tribes. Defendant McIntosh claimed the same land, having purchased it under a grant from the United States. It appears that in 1775 members of the Piankeshaw tribe sold certain land in the Indiana Territory to Lord Dunmore, royal governor of Virginia and others. In 1805 the Piankeshaw conveyed much of the same land to William Henry Harrison, governor of the Indiana Territory, thus giving rise to conflicting claims of title. In reviewing whether the courts of the United States should recognize land titles obtained from Native Americans prior to American independence, the court decided that they should not. 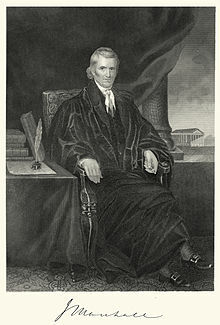 Chief Justice John Marshall had large real estate holdings that would have been affected if the case were decided in favor of Johnson. Rather than recuse himself from the case, however, the Chief Justice wrote the decision for a unanimous Supreme Court. Marshall found that ownership of land comes into existence by virtue of discovery of that land, a rule that had been observed by all European countries with settlements in the New World. Legally, the United States was the true owner of the land because it inherited that ownership from Britain, the original discoverer. On the discovery of this immense continent, the great nations of Europe ... as they were all in pursuit of nearly the same object, it was necessary, in order to avoid conflicting settlements, and consequent war with each other, to establish a principle which all should acknowledge as the law by which the right of acquisition, which they all asserted, should be regulated as between themselves. This principle was that discovery gave title to the government by whose subjects, or by whose authority, it was made, against all other European governments, which title might be consummated by possession. ... The history of America, from its discovery to the present day, proves, we think, the universal recognition of these principles. Chief Justice Marshall noted the 1455 papal bull Romanus Pontifex approved Portugal's claims to lands discovered along the coast of West Africa, and the 1493 Inter Caetera had ratified Spain's right to conquer newly found lands, after Christopher Columbus had already begun doing so, but stated: "Spain did not rest her title solely on the grant of the Pope. Her discussions respecting boundary, with France, with Great Britain, and with the United States, all show that she placed it on the rights given by discovery. Portugal sustained her claim to the Brazils by the same title." Marshall pointed to the exploration charters given to John Cabot as proof that the British had operated under the doctrine. The tribes which occupied the land were, at the moment of discovery, no longer completely sovereign and had no property rights but rather merely held a right of occupancy. Further, only the discovering nation or its successor could take possession of the land from the natives by conquest or purchase. The doctrine was cited in other cases as well. With Cherokee Nation v. Georgia, it supported the concept that tribes were not independent states but "domestic dependent nations". The decisions in Oliphant v. Suquamish Indian Tribe and Duro v. Reina used the doctrine to prohibit tribes from criminally prosecuting first non-Indians, then Indians who were not a member of the prosecuting tribe. The doctrine has been cited by the US Supreme Court as recently as 2005, in City of Sherrill, NY v. Oneida Nation: "Under the 'doctrine of discovery...' fee title (ownership) to the lands occupied by Indians when the colonists arrived became vested in the sovereign-first the discovering European nation and later the original states and the United States." As the Piankeshaw were not party to the litigation, "no Indian voices were heard in a case which had, and continues to have, profound effects on Indian property rights." Professor Blake A. Watson of the University of Dayton School of Law finds Marshall's claim of "universal recognition" of the "doctrine of discovery" historically inaccurate. In reviewing the history of European exploration Marshall did not take note of Spanish Dominican philosopher Francisco de Vitoria's 1532 De Indis nor De Jure belli Hispanorum in barbaros. Vitoria adopted from Thomas Aquinas the Roman law concept of ius gentium, and concluded that the Indians were rightful owners of their property and that their chiefs validly exercised jurisdiction over their tribes, a position held previously by Palacios Rubios. His defense of American Indians was based on a scholastic understanding of the intrinsic dignity of man, a dignity he found being violated by Spain's policies in the New World. Marshall also overlooked more recent American experience, specifically Roger Williams's purchase of the Providence Plantation. In order to forestall Massachusetts and Plymouth designs on the land, Williams subsequently traveled to England to obtain a patent which referenced the purchase from the natives. The Royal Charter of Rhode Island issued by Charles II acknowledged the rights of the Indians to the land. Nor does Justice Marshall seem to have taken note of the policy of the Dutch West India Company which only conferred ownership rights in New Netherland after the grantee had acquired title by purchase from the Indian owners, a practice also followed by the Quakers in Pennsylvania. Watson and others, such as Robert Williams Jr. suggest that Marshall misinterpreted the "discovery doctrine" as giving exclusive right to lands discovered, rather than the exclusive right to treaty with the inhabitants thereof. Discovery doctrine has been severely condemned as socially unjust, racist, and in violation of basic and fundamental human rights. The United Nations Permanent Forum on Indigenous Issues noted Discovery doctrine "as the foundation of the violation of their (Indigenous people) human rights". In 2012, the United Nations Economic and Social Council Permanent Forum on Indigenous Issues called for a mechanism to investigate historical land claims. During the General Convention of the Episcopal Church conducted on 8–17 August 2009, the bishops of the church adopted a resolution officially repudiating the discovery doctrine. At the 2012 Unitarian Universalist Association General Assembly in Phoenix, AZ, delegates of the Unitarian Universalist Association passed a resolution repudiating the Doctrine of Discovery and calling on Unitarian Universalists to study the Doctrine and eliminate its presence from the current-day policies, programs, theologies, and structures of Unitarian Universalism. In 2013, at its 29th General Synod, the United Church of Christ followed suit in repudiating the doctrine in a near-unanimous vote. At the 2016 Synod, 10-17 June in Grand Rapids, MI, delegates to the annual general assembly of the Christian Reformed Church rejected the Doctrine of Discovery as heresy in response to a study report on the topic. At the 222nd General Assembly of the Presbyterian Church (U.S.A.) (2016), commissioners called on members of the church to confess the church's complicity and repudiate the Doctrine of Discovery. The commissioners directed that a report be written reviewing the history of the Doctrine of Discovery; that report was approved by the 223rd General Assembly (2018), along with recommendations for a variety of additional actions that could be taken by the church at all levels to acknowledge indigenous peoples and to confront racism against them . Also in 2016, on November 3, a group of 500 clergy members publicly denounced the Doctrine of Discovery at the Standing Rock pipeline protests. ^ Harjo, Susan Shown (2014). Nation to Nation: Treaties Between the United States & American Indians. Washington, DC: National Museum of the American Indian. pp. 15–16. ISBN 9781588344786. ^ a b Dunbar-Ortiz, Roxanne (2014). An Indigenous Peoples' History of the United States. Boston: Beacon Press. pp. 197–201. ^ a b c Newcomb, Steve (Fall 1992). "Five Hundred Years of Injustice". Shaman's Drum: 18–20. Retrieved 2007-01-10. ^ Robertson, Lindsay G. (June 2001). "Native Americans and the Law: Native Americans Under Current United States Law". Native American Constitution and Law Digitization Project. The University of Oklahoma Law Center. Retrieved 2007-01-10. ^ "Preliminary study of the impact on indigenous peoples of the international legal construct known as the Doctrine of Discovery" (PDF). United Nations Economic and Social Council. 4 Feb 2010. Retrieved 4 January 2014. ^ "Doctrine of Discovery". HR/5088. United Nations Economic and Social Council. 8 May 2012. Retrieved 21 November 2013. ^ Schjonberg, Mary Frances. "General Convention renounces Doctrine of Discovery", Episcopal Life Online, 27 August 2009. ^ "Synod 2016 Rejects Doctrine of Discovery as Heresy". Retrieved 2016-07-21. ^ PC(USA) "Doctrine of Discovery Report". For action by the 222nd General Assembly (2016), see business item 11-17; for actions by the 223rd General Assembly (2018), see business item 10-12 and 10-13. Miler, Robert J., and Jacinta Ruru. "An Indigenous Lens into Comparative Law: The Doctrine of Discovery in the United States and New Zealand." West Virginia Law Review 111 (2008): 849.